* Not all experiments are supported in Graphical Analysis 4 at this time. Additional software features and sensor support, including Photogate support, are planned for Spring 2018. Free updates to the experiments, available through your Vernier account, will include instructions for using Go Direct sensors. 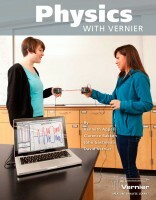 Weiterführende Links zu "Physics with Vernier"
Weitere Info "Physics with Vernier"
Kundenbewertungen für "Physics with Vernier"